International Human Resource Development provides thought-provoking questions and stimulating answers to key issues in human resource development today, putting HRD in its strategic organizational context and examining in depth the process of learning from different perspectives. 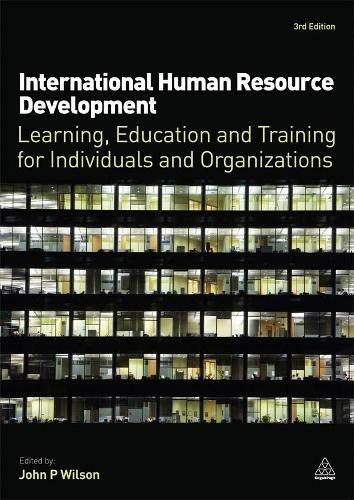 This third edition provides a thorough exploration of international human resource development, and has been completely updated and revised with a variety of case studies and contributions from a range of HR development experts, making it the most topical book in this field. It also addresses the increasingly important area of knowledge management, incorporating learning and development. Clearly structured and mapped against the current Chartered Institute of Personnel and Development (CIPD) standards, this comprehensive handbook covers each aspect of the training cycle, including the role and identification of learning, training and development needs in organizations, working in multicultural and multilingual settings, learning and competitive strategy, planning and design, delivering effective training programmes, assessment and evaluation, international development and managing the human resource function.